About An architectural shot. Set the white balance for tungsten as I like the deep blue colours, however not sure if this one is a bit too much. At any rate, my goal was to show the structure as an efficient mechanical and industrious creature. Very interesting, I like the composition, which I find unusual, and colors. 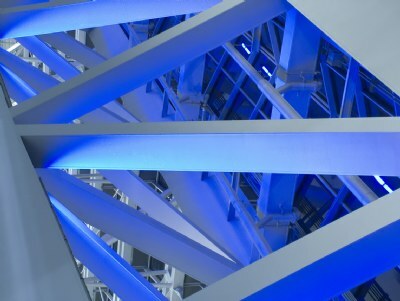 Blue steel, quite cold looking, and quite strict in its geometry, that provides the construction such a stability! Getting such strong contours of blueish on blueish tones is an achievement for itself, and keeping the DoF over the whole range of interest is an additional one. Both of them make it to something very special in the category of abstracts. Only the upper right corner could have a bit less of that greyish surface, but that's all I would change. Greate work and indeed a BIP, james! Congratulations! hmmm, i just noticed (after posting my most recent comment) that i had already replied to you on your comment mark. this one makes three. haha well bump up the numbers a bit i guess. hi mark. as for this photo, i was almost in the rafters, there's a small observation deck in the departures lounge area that lets you get this close to the ceiling in suvarnabhumi airport, but its not terribly easy to find. i havent moved to thailand, i was only there on holiday for most of the past month. i'm now back in guangdong province and will be here till the summer now, maybe longer, not sure yet. Hi Mark. I havent moved to thailand, only here on holiday for chinese new year. mainland china is nothing but chaos during the lunar new year holiday so its best to just go out of country for awhile. i've also been away from UF for awhile, only now posting a few shots that might be interesting. look forward to your email, and perhaps meeting one day soon. Oh, and congrats on the BIP award! Well deserved. The decision to set the white balance for tungsten was a brilliant one. The color adds so much interest and depth to the shot. How did you get the point of view for this ... it looks like you are in the rafters. On another subject, I have been away from UF for a very long time. When did you move to Thailand? I hope all is well. I'll try to drop you an e-mail in a few days. Sweet shot! love the coloring as well as the vision...i would never have thought to shoot this....great eye...congrats on the award. Hey have you moved back to Canada!? Hi Bhabesh. Thanks for the comment. In fact, the lights on the ceiling at the new Suvarnabhumi Airport in Bangkok are blue, so the WB setting only enhanced what was already there. An unusual POV that shows the great complex nature of the structure. Normally I like monochrome tonal quality for this kind of pictures, and don't know which one would be better, but certainly the blues are eye catching. Well seen and photographed, surely an winner.